Butch Cassidy became disenchanted with robbery and began rustling again. From left to right, standing: William Carver, Harvey ‘Kid Curry’ Logan. Butch Cassidy was born as Robert LeRoy Parker in Beaver, Utah, on 13 April 1866, one of ten children. He adopted the name Butch Cassidy aged 16 after meeting cowboy, Mike Cassidy, and becoming a cattle rustler. Butch took over Mike Cassidy’s small gang when Mike Cassidy shot a Wyoming rancher. 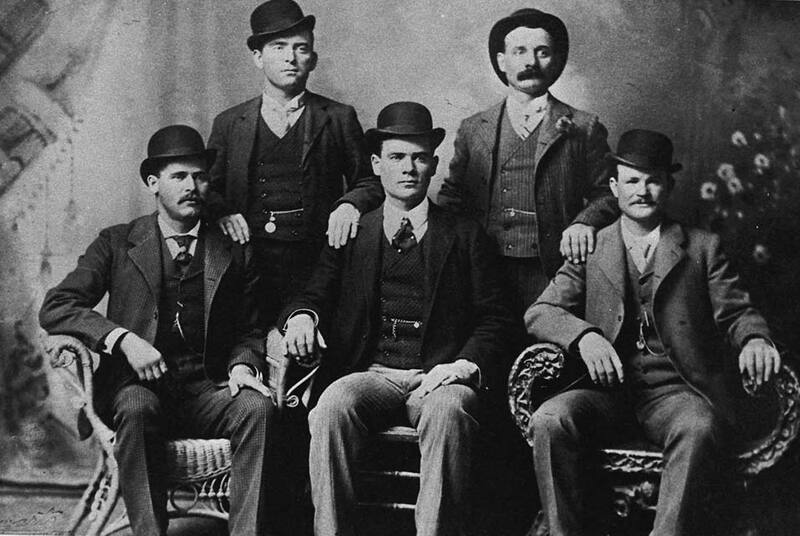 In early 1887 Cassidy met Bill and Tom McCarty and joined their gang. On 3 November 1887 Cassidy and the McCarty gang robbed the Denver and Rio Grande Express near Grand Junction, Colorado. The guard refused to open the safe and Bill McCarty threatened to shoot him but the gang members voted not to kill the man so the gang moved off without making a cent. Butch Cassidy became disenchanted with robbery and began rustling again. On 30 March 1889 Cassidy and the McCartys robbed the First National Bank of Denver of $20,000. On 24 June the gang robbed a bank in Telluride, Colorado of $10,500. In both robberies the gang never fired a shot. A huge posse was raised so Cassidy went into hiding and took honest employment. However, he ended up in jail after punching a drunk and being convicted of disturbing the peace. On his release hebecame an extortionist with Al Hainer. If ranchers did not pay up, the two rustled their cattle. They were caught and on 15 July 1894 were sentenced to two years in jail. On 19 January 1896 Cassidy was released and went to the Colorado hideout known as the Hole in the Wall. There he linked up with the Wild Bunch (search the article). With them, he organized bank robberies, scouting ahead to ensure the success of each plan. Over the next few years Cassidy and his new sidekick, the Sundance Kid, robbed several trains, netting more than $100,000. What happened to Butch Cassidy and the Sundance Kid remains a mystery. They travelled to Fort Worth, Texas where the Sundance Kid hooked up with a woman named Etta Place and all three moved on to New York. Next stop was Bolivia where, in spring 1908, they were cornered after a robbery and shot. Some stories say both were killed, others that Sundance was mortally wounded and Cassidy finished him off before escaping with the loot. Butch Cassidy supposedly made it back to the States where he died on 20 July 1937, 1943 or 1944. (depending on the source). During his period of honest employment in the late 1880s, he became a butcher in Rock Springs, Wyoming where he was given the nickname Butch.